My daughter once had a doll. 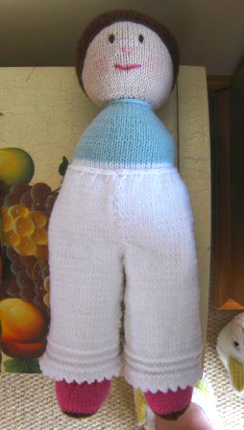 A doll that was lovingly knitted for her, when she was small, by my grandmother. 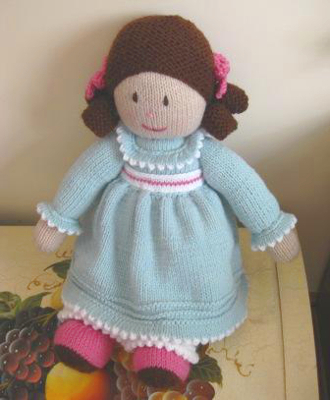 We had this doll for many year,but, due to having to move house many times over the years, somehow she got lost along the way. Fast forward a few more years and I decided to recreate her! So that my daughter could have her doll back. Although my daughter was by then a teenager, I thought she would like it. 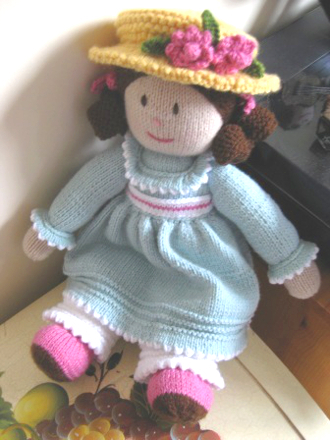 I realised the doll had a similar look to another family doll we have, so from that I was able to identify that it was a Jean Greenhowe design, and was able to buy the pattern book our doll is in, Traditional Favourites. Her name is “Emily”. To give me some motivation to get Emily done I did this as a project in the Ravellenic Games on Ravelry, so I would have a deadline. However, on day one of the challenge, I had an accident moving things in my garage and really hurt my left index finger badly, so throughout this project I had it strapped up as it was healing. This made things a bit more difficult! But I managed it. I took progress photos all through the making of Emily, so I could have a record of all her stages as she came to life, and I’d love to share these with you. The body and head were the first piece. The features are made with wool and embroidered on. The pink blush on the cheeks is really cleverly done by rubbing a pink pencil over them. She was already looking really cute! The neck is drawn in by pulling yarn tight around the neck, I used two strands here for neatening it off; I felt it was tidier than one. I took a lot of care with the stuffing as I think it’s so important with toys to get the amount just right. I measured the circumference as I was stuffing to get it to match the amount of stuffing in the pattern directions exactly. Next she got her main hair piece, it’s like a small cap made in the hair colour which is stitched into place on the head. Also some feet and legs. 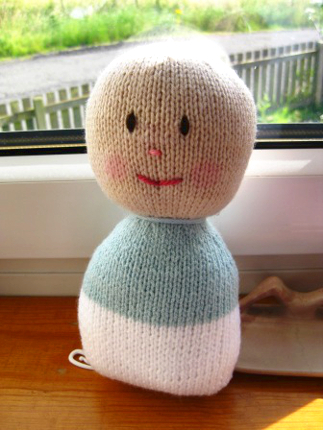 I love the way the little feet were made, similar to baby booties, and in two colours. On the needles next to her are the start of her “pantelets” which are bloomer type under-trousers. 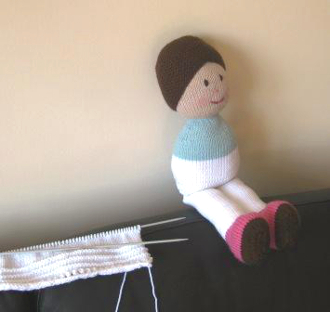 I knitted all of this project on straight needles, I found it more comfortable, possibly because of the injury! The pattern is all pieces that are worked flat and seamed up. She’s posing on the back of my sofa there. I think she looks happy already! The pantelets were such a lot of work! They were made in two pieces and stitched up with a picot hem at the bottom, not difficult to knit and shape, but all knitted on 3mm needles with the dk yarn at quite a tight tension like all of the pieces are. 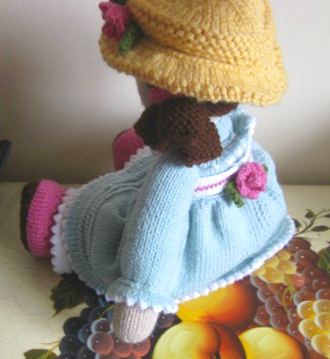 The double crepe yarn I picked for all her clothed parts looks lovely and gave the result I wanted for Emily, but is not particularly smooth to knit, so it’s quite tiring on the hands. There isn’t much give in it and it doesn’t slide much over the needles. Here she is taking a lie down! 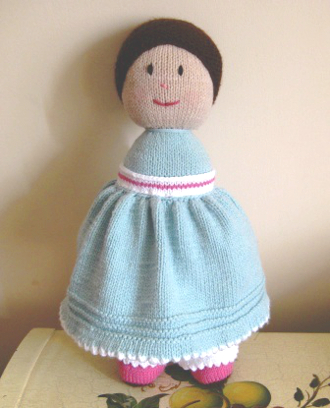 Now she was really starting to look like a pretty dolly, and waiting patiently for me to get on with the rest. I was getting a little tired by now, and hands hurting a bit but there was still lots of time to get her done, and seeing her take shape was really motivating! My daughter kept checking up on my progress and giving encouragement, so that helped too! Next came the skirt and belt. The skirt has a deceptively large amount of work in it! It is seamed up at the back and gathered in at the waist. The pattern instructs to use a backstitch seam on the skirt and similar parts but I found it hard to avoid getting a seam gully that I wasn’t keen on, so I used a bickford seam for a lot of these pieces. I blocked the skirt really carefully before attaching it as I wanted it to look nice and smooth and keep a nice shape. The little belt was just a small strip which was a relief after the huge skirt! The skirt looked just beautiful when it was on, and it’s such a pretty design with the pantelets peeking out from under all that fabric. Here we have the arms and hands! These were quite quick to make. The important things to me here were achieving a nice neat oversew between the hands and sleeves (even though this would later be mostly hidden by the ruffles), and the stuffing again. For the stuffing, I just didn’t want to get the “muscled” look that can so often happen when stuffing toy arms so I was quite sparing with the filling at the tops of the arms and the shoulders. I love her cute little round hands, something so charming about them! So now all her limbs were on and her clothing in place, the end was starting to be visible! This was a really fun part! Ruffles, ringlets and bows. I really enjoyed seeing Emily come to life even more! The ringlets are just darling, my daughter calls them “sausage hair” which is funny. 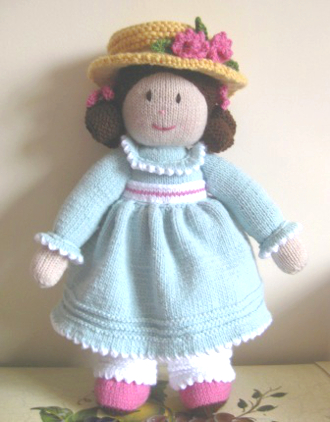 The little ruffles are all made with picot edging. I spent quite some time making sure everything was pinned very precisely, where the details would look best, before stitching on. It’s well worth it to me to take the extra time to be picky. 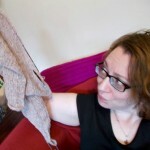 Even though, I have to admit, I never feel like it after so much knitting and sewing already! I think taking all that care at this stage did make a difference to the finished item. The hat! Oh my goodness, this took so much yarn! 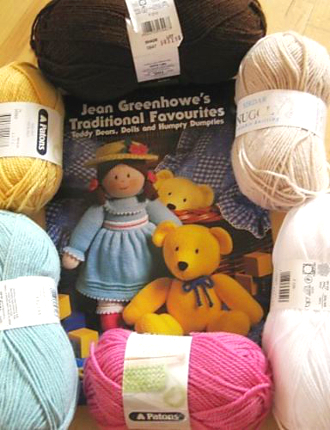 I had bought a 50g ball of pure wool for this, thinking it should be more than enough. I wanted wool for the hat and flower details rather than acrylic or a blend as I knew it would keep the best shape. I wasn’t concerned about mixing it with the acrylics in the other parts, as long as Emily is washed in cold water, which she will be. I finished the hat with just a little bit left for sewing it together and onto the head, and only had a few millimetres left over once it was done! Again I did some blocking here, the top of the hat and the brim won’t lie flat without it. I blocked the hat upside down with a can inside it to flatten the top and give a good shape to the sides, a tip I had picked up from another project on Ravelry. A little flower on the back…and Emily was finally done! here are a few more photos of her with her sweet clothes and pretty decorations. My daughter loves her, and so do I! 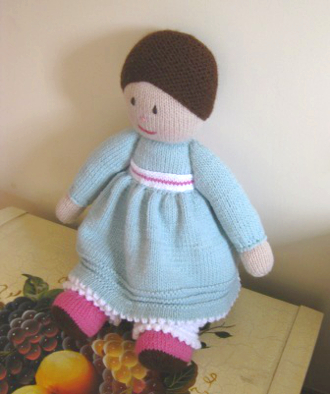 Have you made an Emily too? Or other Jean Greehowe designs? We’d love to see! Visit us in the forum where you can post your pictures..